I’m wrapping up the one year house tour today with the sunroom, kitchen, and breakfast room. And I confess that once again, I didn’t take any new pictures of these room. 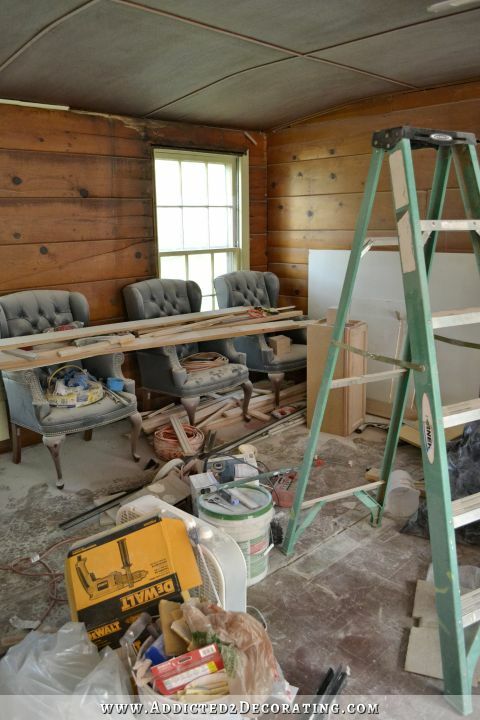 Y’all have seen plenty of the kitchen and breakfast room over the last four months, and there’s absolutely nothing new going on in the sunroom. But I’ll certainly share my plans with you! And then after the tour, I’ll answer some questions that I’ve gotten over the last few days regarding our house. The sunroom is a very large room located at the back of the house. It’s not original to the house, and whoever built it really didn’t put a lot of effort into it. 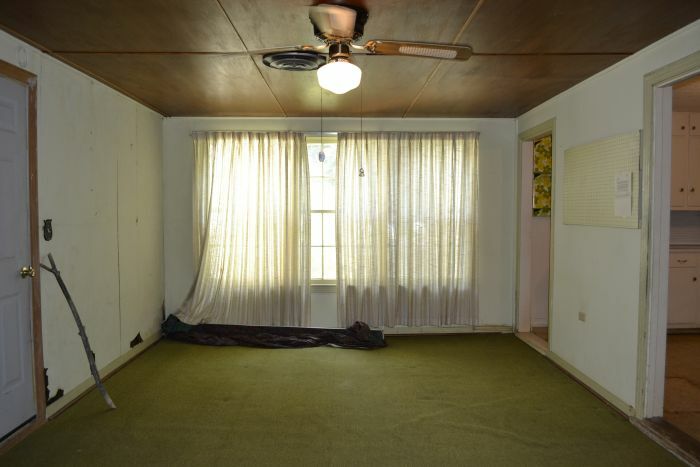 It’s more like a glorified covered patio with an air conditioner, some windows, and a sliding glass door. These days, it looks pretty much the same, except messier. That far end is now where I have my washer and dryer (where those cardboard boxes are, underneath the bathroom window) and the hot water heater (in the far left corner). I had those things moved over there when we first moved in because my plan at the time was to eventually create a laundry room/utility room at that end, and turn the end closer to the breakfast room into the family room. But my plans have since changed. Anyway, here’s the view looking back the other way. Again, nothing has changed except that I use that end to store things that are still in boxes, and some extra furniture that I’m not using right now. 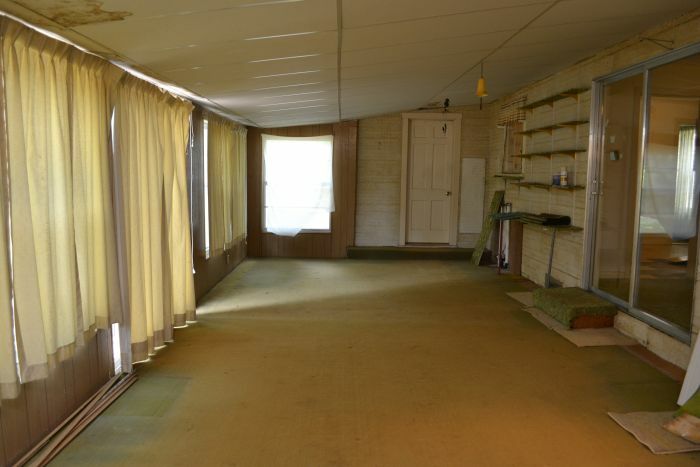 That door straight ahead on the right goes to the breakfast room. 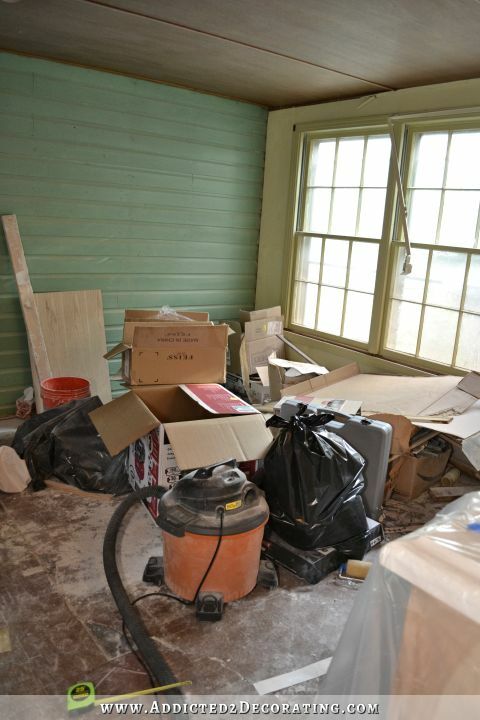 The sliding glass door on the right side of the picture has now been removed, and that goes to the music room. When Matt’s dad was here in February, he built Matt a wheelchair ramp so that he could get into the sunroom and then out into the back yard. That’s why the glass door had to be removed in the first place — it was too difficult for Matt to get through. 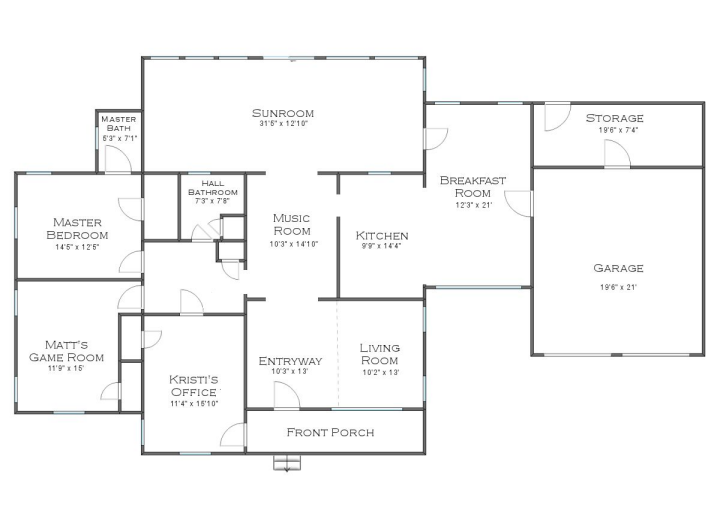 As far as the plans go, this room is very much like the “master bathroom” we currently have. There’s really nothing that can be done to salvage it in its current condition. The floor is literally pieces of loose particle board (not even plywood! particle board!) placed on the ground and leveled in a few places with bricks and gravel, and then carpet rolled out on top of it. The carpet isn’t stapled or secured at all. And you can see how low the ceiling is. On the side with all of the curtains, I can actually stand there and touch the ceiling, and I’m only five feet tall!!! 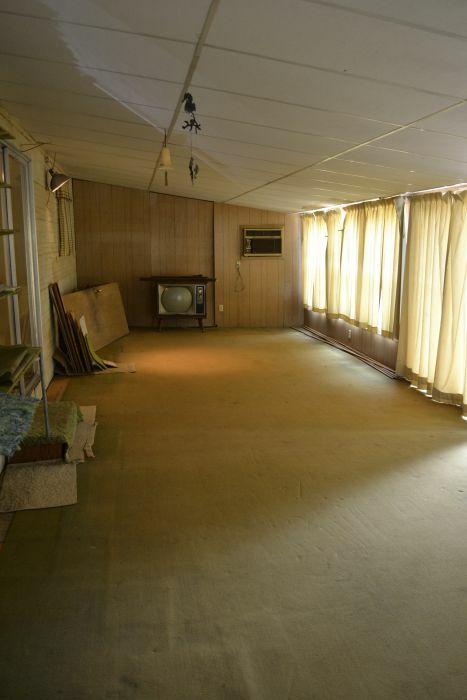 So this room will have to be completely torn down and rebuilt so that it’s level with the rest of the house (no step down into the room), and the ceiling is the proper height. That will also give us the opportunity to expand the room towards the back yard about five or six feet to accommodate everything I want in this space. This was my absolute favorite idea that came about from my “Where can I put a pantry?” post the other day. 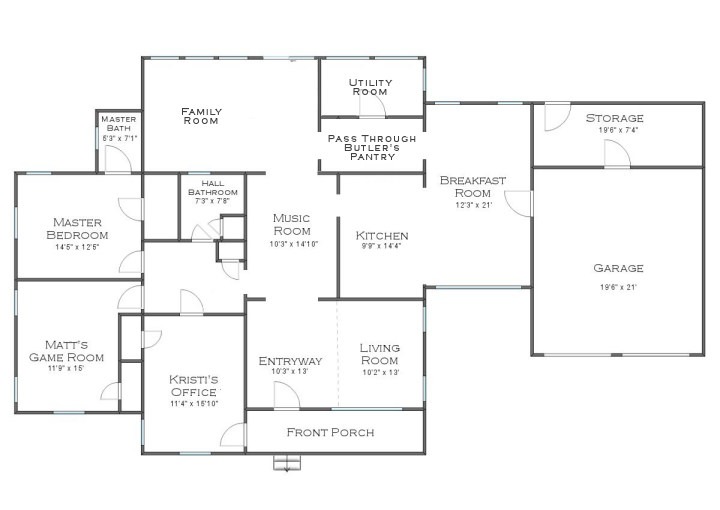 I had originally planned on putting the family room on the right side closer to the breakfast room, and the utility room on the left side. But something about that doorway from the breakfast room leading directly into the family room just didn’t sit well with me at all. This way feels much better to me, having that walk through butler’s pantry as a transition area between the breakfast room and family room. Here’s how this room started out. Standing at the back of the breakfast room and looking towards the three big windows at the front of the room, this is what it looked like. You can see the wall separating the breakfast room and the kitchen. 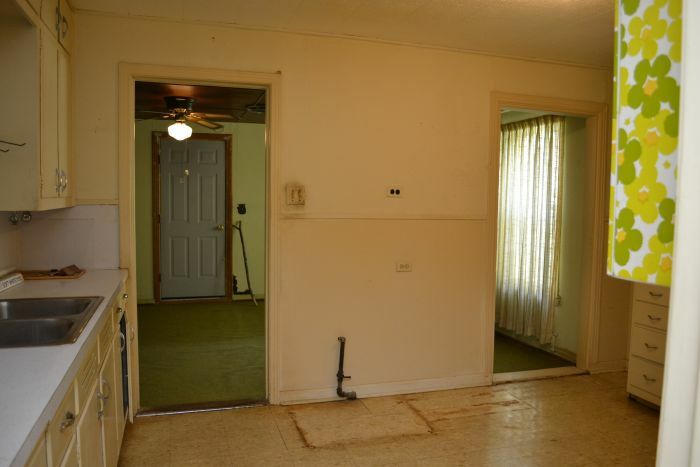 That door on the left goes to the sunroom. It actually looks a bit better than that now because my mom came over and cleaned up quite a bit of the mess for me. As of right now…this very moment (because y’all know I can change my mind at a moment’s notice)…the plan is to leave the actual structural part of the ceiling alone. There will be no vaulting or raising the ceiling joists or anything like that. 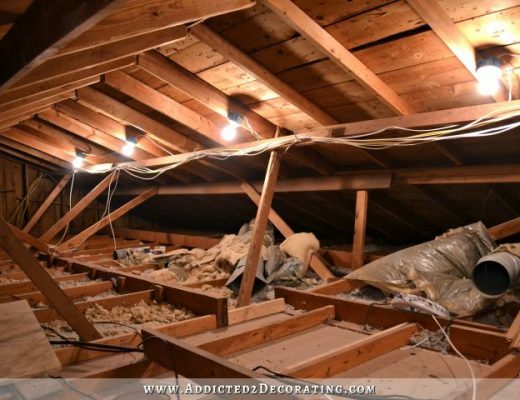 But I would love to remove the plywood that’s currently on the ceiling, and then instead of drywalling the ceiling, I’d like to install tongue and groove wood slats above the ceiling joists so that the ceiling joists are exposed. This was one of the suggestions made when I posted about my breakfast room ceiling a few weeks ago, and the more I’ve thought about it, the more I love that idea. 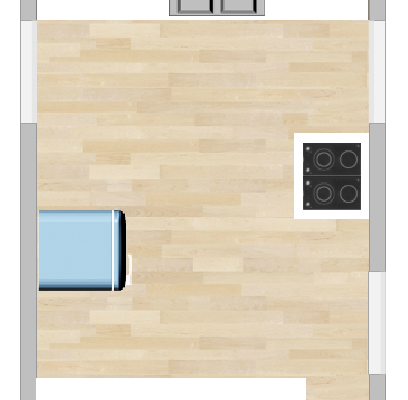 While that wouldn’t actually give more space between the floor and the ceiling (because the ceiling joists would still be low), it would give the illusion of a higher ceiling. And really, that’s all I need. I’m still not even sure if this is feasible because I haven’t yet ventured up into the attic to see what our ceiling joists look like and what condition they’re in. If it turns out that they’re not really something I’d want exposed, then I might just drywall the ceiling and be done with it. And speaking of drywall, I’ve decided to just drywall right over all of the random shiplap siding and tongue and groove paneling that currently covers the walls. Why remove all of that? It provides a firm base for the drywall, and it also provides an extra layer of thickness to insulate the room. Of course, I’ve already told y’all that I’m done with drywall, so I would hire that out. I actually have someone coming tomorrow to give me an estimate. 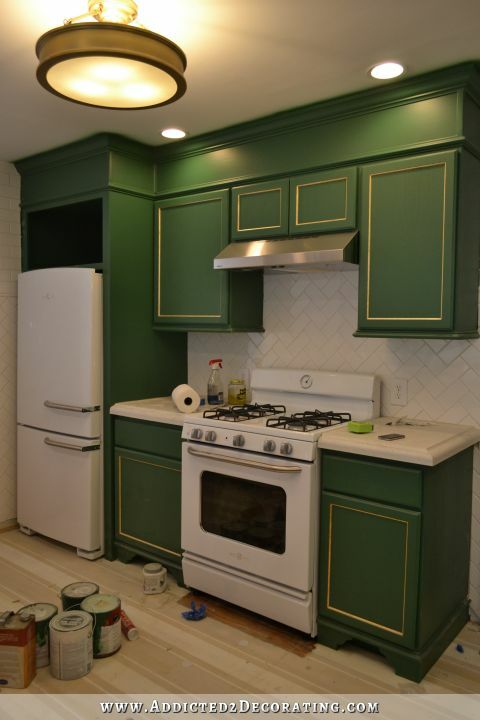 The Kitchen – 95% complete!!!! I have another confession. I haven’t done one single thing in my kitchen for a week now. Not even one tiny little project. Week before last, as I was trying to meet my goal of finishing by the 18th, I worked all day every day, and worked until midnight or later three nights in a row. I worked myself into a state of complete and utter exhaustion. Matt was concerned for me. Frankly, I was concerned for myself. So Matt insisted (and I didn’t take much convincing) that I take the week off from the kitchen remodel. So I spent last week taking things easier, cleaning my house, getting things put back in order, and doing the things that I’ve neglected since I started on the kitchen remodel. I’ll get back to this kitchen this week, now that I feel rested and refreshed, and hopefully be able to work more efficiently and get this project finished up. But let’s take a quick look back, shall we? 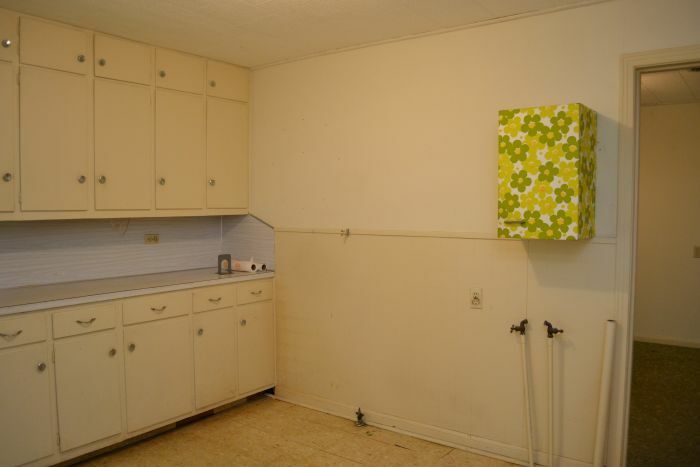 Here’s how the kitchen started out when we bought the house. The sink was originally on this wall, and the window (originally an exterior window) looked out to the sunroom. …is now gone, and there’s a peninsula where the sink is now located. I really don’t mind questions like these, and I’m happy to answer them. I think having this info helps people to have a better understanding of what it’s like to take on fixer upper like I’ve done, and to decide whether or not it’s something they could do themselves. Of course, house prices very drastically throughout the country, so my situation might not be what you’ll find in your own area. 1. How much did you pay for your house? We paid $82,000 for our house, put $20,000 down, and have a mortgage of $62,000. Our monthly payments are lower than the cost of rent for a one-bedroom apartment in our area. That’s one reason we can put so much towards fixing up our house. We’re not straddled with a huge monthly mortgage payment, and we’re not house poor. 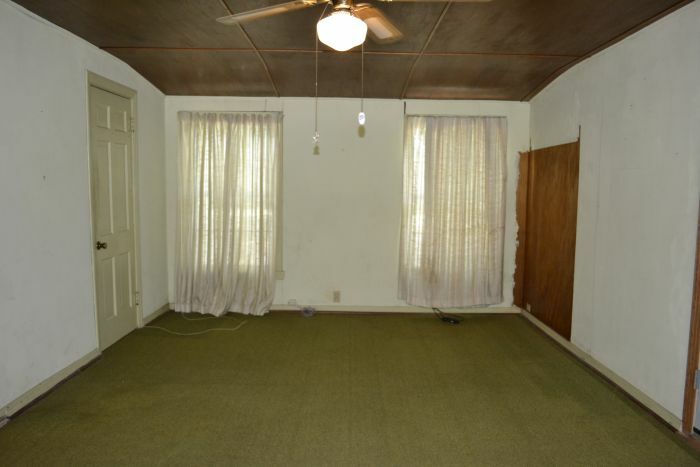 That, in my mind, is one of the best reasons for buying a fixer upper. There’s such freedom of mind that comes with having such a tiny house payment. 2. What is your neighborhood like? So it’s a real interesting mix, probably similar to what you’d see in many (most?) cities in the older parts inside the city limits. The neighborhood is wonderful. I have amazing neighbors, and the neighborhood is very quiet with very minimal traffic. The kid across the street plays basketball in the street all the time without being bothered too much by traffic. 3. What is your budget for fixing up your house? I don’t have one. I’m just going to work from room to room, fixing up each room as I want it, doing what I see needs to be done (like new drywall on the ceiling), and spending as wisely as I can. And then when it’s done, it’s done. If I was forced to put a number on it, I’d guess that we’ll end up spending about $100,000 to $120,000 by the time it’s all said and done. Now keep in mind that that will be spent over the course of the next 7 to 10 years…maybe a bit more. Also keep in mind that we only paid $82,000. So even if we put a total of $120,000 into it (which will all be paid in cash as we go along…we don’t do credit cards), that will still only be a total of $200,000 that we’ve paid for our house, which will end up being about 2900 square feet on a one acre lot. $200,000 for a house that is completely designed and decorated to my liking, and that needs no further modifications or remodeling, is quite a reasonable price if you think about it. Many people spend several hundreds of thousands of dollars on a house, and then still want to make structural modifications and have to furnish and decorate the house on top of that. 4. What about the return on your investment? Will you be able to get that back? I don’t know, and I’m not concerned with that at all. We’re planning on staying put here for good. Once I spend the next 7-10 years fixing up this house and getting it just like I want it, and putting all of that blood, sweat and tears into it, the last thing I’d want to do is pack up and move. And there’s absolutely no reason that we’d need to move, so we’re not planning on it. Ever. 5. Do you still have your condo? Yes, we still have the condo. It’s just sitting there gathering dust. I know…that’s the dumbest thing ever when we can sell it or rent it out and collect money rather than throwing away money each month. I need to get over there and spend about a week finishing up some little projects, cleaning out all of the rest of our stuff, and then get it on the market or get it listed for rent. It’s very close to Baylor University, so I don’t think we’ll have any trouble selling or renting it if I can ever get my act together and do what needs to be done. Fortunately, the mortgage on that is tiny as well. But still…it’s money wasted, and I need to be wiser with our money than that. So hold me to it. As soon as the kitchen is finished, and before I start any other house projects, I need to get the condo in selling/renting condition. Ok, this is none of my business, but asking anyway. How is all this financed? I know Matt has MS. Is he able to work? You can’t possibly be working elsewhere with all you do on the house. You are such a Wonder Woman. I am in AWE of you!!! I’ve been wondering that too actually… Sponsors perhaps? Old fashioned, it is then! I’m right there with you, Cathy in WV! My friends say I’m old-fashioned because I’m young but have certain conservative values and manners that my parents instilled in me, and these questions – to me, at least – really border on being too personal. It feels like Kristi is being asked about her income/finances, and while she shares a lot with us, to me that’s crossing a line. However, Kristi is good natured and may not feel like people are prying, so the questions are, of course, up to her to answer or not. I had the same situation with a condo when I bought my fixer upper Kristi. I bought my house in May but wasn’t able to move into it until November due to having to make it livable. Then I let my condo just sit thinking I would get all the necessary repairs made over the winter. Well I didn’t. But when I put my rear in gear I got it done and listed in June it sold on the first day it was listed!!! Just not to have it hanging over my head (plus that monthly mortgage and HOA fee) was such a good feeling. You will get it done and I’m sure it will go fast for you too. 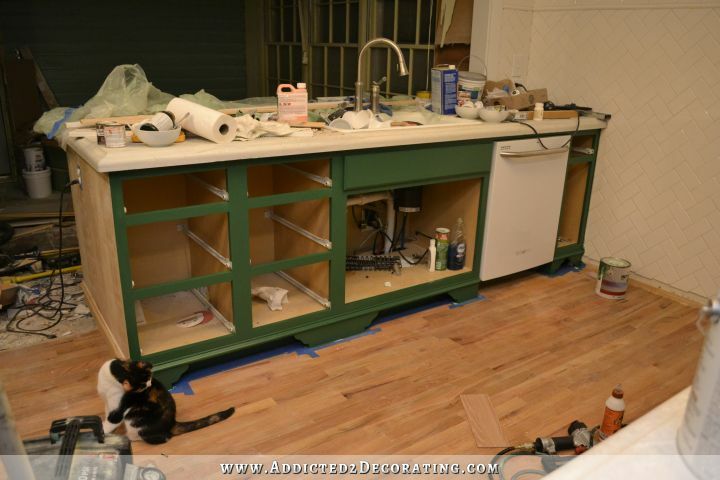 How do you plan to finish the insides of your kitchen cabinets? Paint (color?) or stain? Thanks! I like how you change your mind so often. That’s good in this case because by the time you get around to the family room, you’ll have lived in the other spaces long enough to see what’s working best and what isn’t. I’m so looking forward to following you for the next 7 to 10 years! I always look for your blog first when I open my email account! These posts have been a wonderful recap! I tend to get so involved in each project update that this has helped me see the overall picture. Thank you! Kristi, I know you don’t have cable, so you don’t get HGTV, but in case you don’t know, the show , Fixer Upper, is Chip and Joanna (Stevens) show. It is really good. You need to take some time off and come over and watch it with me sometimes. I love “Fixer Upper”!! That is hands down one of the best shows HGTV has ever had. That is the sweetest couple ever and they do such an amazing job on those old houses. I am also looking forward to the next 10 years of watching you diy your home. I was hoping to meet your dog though….. Yes, I want to meet the dog too! Wow! Your honesty is so refreshing. I love your blog and check it daily (even the weekends when you usually don’t post). I have a question that has nothing to do with your post. I’ve started looking at blogs lately for home decorating. I blame you because I’ve enjoyed yours so much I had to see what all is out there. I notice people posting pics of their homes and rarely if ever do I see their family pictures displayed. I love family pictures and curious what is considered the best way to display photos? Honestly I don’t understand posting family photos. Maybe someone could explain it. Why would i post pics of my kids? I live with them; I see them everyday! I really appreciate your frankness and philosophy of financing your home and remodel. It is a practical and refreshing change to hear someone open up about this. I hope more people look at the potential in their own town before buying a home that is more then they can handle. I love your blog. Great job on your home! I also watched a few shows of Fixer Upper on HGTV yesterday afternoon, and was constantly thinking of you. LOL. Of course, most of them went too fast for us to see anything more than results. Yours is so much more fun, walking with you through every step of it. In their own country house, the lady had painted some of the shiplap and just left it like that. I wasn’t 100% sold on that, as I felt the cracks were too big between them. Anyway, I was very pleased that some houses were saved rather than destroyed. Thanks for listening to Matt and taking a week off. Yes, I’m glad you took a week off for needed rest. 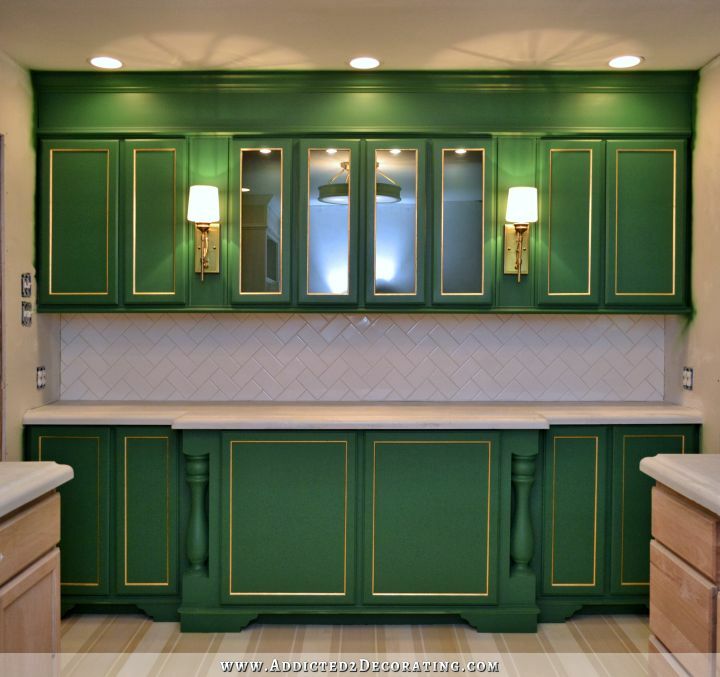 Your kitchen will with the mirrored uppers and sconces? STUNNING. I’m thoroughly enjoying watching your home come together. Thank you for sharing and inspiring us! I’ve been really curious about your butler’s pantry. Will you keep food in cabinets in the kitchen too or will all the dry food be in the pantry? It seems like a hassle to have all your food kept in a room that’s not right there in the kitchen where you cook. But then I think I remember you said you don’t really cook much, so maybe it’s not a concern for you? I’ve been meaning to respond to this question for awhile now as there seems to be a misconception about what a Butler’s pantry is. It is traditionally used for serving pieces, not food. 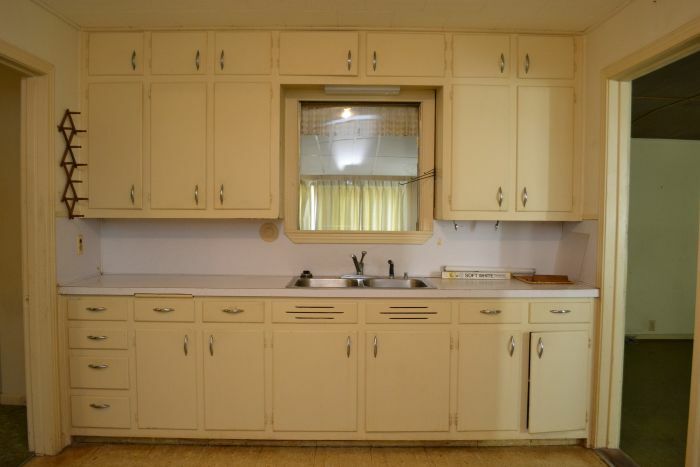 The kitchen would be used to store food staples for cooking and then the breakfast room would be serviced or set with dishes, glasses, serving pieces from the butler’s pantry. You would also keep tea and coffee service in there. It is a butler’s pantry, not a chef’s food pantry. Kristi, please let us know if you are planning to use it in a different way! been watching your progress with great interest. I can’t believe what a big project you have undertaken and how quickly you have progressed whilst holding down a job and looking after your home. 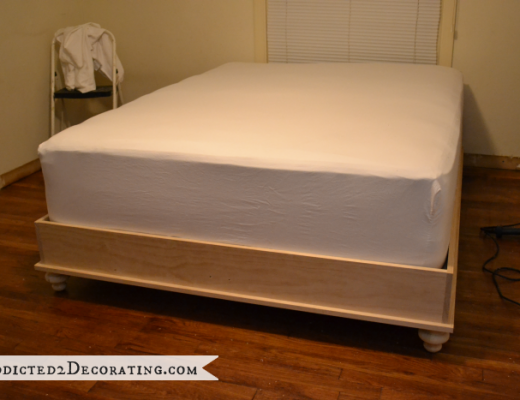 I read you were thinking about planked ceiling and beams and I thought I would tell you about a blog called Jenna Sue. 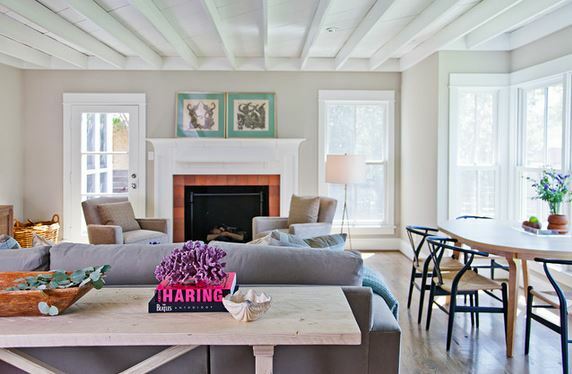 They have created faux wooden beams in their new home and it looks amazing. I think you might be interested. Take it easy girl. Rome wan’t built in a day!